You’ve probably heard said, “I learned everything I need to know in kindergarten,” or something like it. Well, in first grade in addition to teaching my lovelies phonics and addition, I like to think I give a refresher course in “everything I need to know.” In first grade we practice sharing and taking turns and putting the caps back on things. We practice loving by saying “you first” and we practice putting trash in the garbage can. We practice “please” and “thank you” (or “por favor” and “gracias”) and we practice starting the day with prayer. We practice asking permission before touching things that aren’t ours and we practice listening when someone else is speaking. We practice washing our hands after using the bathroom and we practice waiting patiently. We practice all these things and more than anything we practice getting this very true truth in our little heads: our actions have consequences. Sometimes the consequences of my little first grade actions are things like losing recess time or not getting to play with the blocks. Sometimes the consequences are a sticker or a piece of candy! But at least once a day I am reminding one little guy or gal that their actions have consequences. 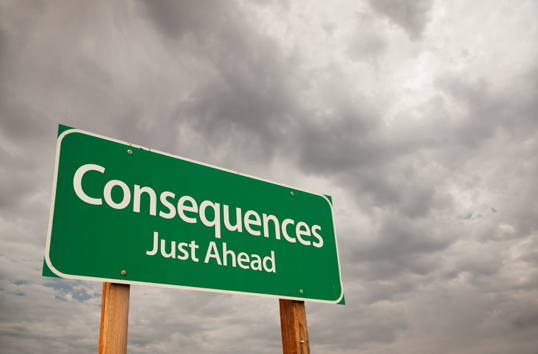 Some consequences are a one time thing and some alter our relationships forever. Towards the end of last year I had an unfortunate conversation with one student who had lied to me multiple times throughout the school year. I told him that while I had forgiven him for lying, I just couldn’t trust him anymore. I had to ask a number of students what happened in a certain situation because I couldn’t count on him to tell me the truth. I explained to him how sad that made me feel, but that those were the consequences of his actions. David, you know, from the Bible, suffered the consequences of some of his actions throughout his entire life. David had a dream of building a beautiful temple for the Lord. When it came time for him to put his dream into action, God said, “No.” Why? Because David had “shed much blood and waged great wars.” (1 Chronicles 22:8) The consequence of David’s violent actions was that he couldn’t honor God in this temple-building way. He who began a good work in you will continue to perfect it. When David chose to sleep with another man’s wife God didn’t throw up his hands and declare David a lost cause. The security of our souls depend neither on the severity nor the frequency of our sin. The consequence of sin (of a Jesus follower) is never separation from God. That consequence only comes to those who have completely rejected God’s offer of salvation. Once you enter God’s family you’re in for life. God never has been and never will be stumped. His kingdom grows, His name is glorified, He continues to reign whether we acknowledge Him or not. His temple was built. David missed out because of his sin, not God. The consequences of our sin only further illustrate who God is. He is a God of order and a God of justice. But He is also a God of great mercy. When we suffer the consequences of our selfish actions, we have no right to pout or whine about missed opportunities. We can only praise God that our sin hasn’t consumed us entirely. Every action has a consequence. The consequence of our sin was Jesus’ death. The consequence of Jesus’ death was our eternal life. Every other action should be made in light of those consequences.